Fighting acne is an incredibly annoying task which often produces little to no results. It's a high-maintenance job that requires continuous efforts if we wish to see results. And the most important step in your acne-fighting routine should be face-washing. If you didn't know already then you should know this. The type of face wash and cleanser you use can greatly affect your overall success in your acne battle. So, here I’ll help you by giving you my 5 best acne face wash choices! Removing all the dirt, oil, extra sebum, and bacteria from your skin is the main thing you need to do – before you move on to any other steps or products. Without this, everything else is useless. This confirms once again the theory of washing your face properly. Properly means having the right face washes and cleansers that fit your skin type and conditions. So, what’s the best acne face wash for you? How to know what to choose? Below, read all about these questions. How to Choose the Best Acne Face Wash for You? Why Face Washes are Crucial if You Have Acne? How to Properly Use an Acne Face Wash? Don't feel like reading 3,422 words? I recommend getting the La Roche-Posay Effaclar Medicated Gel Cleanser, its great for most skin types and is also recommended by 25,000 dermatologists worldwide! Some acne face washes are meant for oily skin, while others are appropriate for dry skin, normal skin, combined skin, etc. Also, there are products which are suitable for all skin types, even if you have sensitive skin. Purchasing an acne face wash that doesn’t fit your skin type can cause an even bigger problem. So instead of helping you, it can actually worsen your acne condition. This part might need some experimenting until you figure out which ingredients work for you. For example, if you have sensitive and dry skin it might be better to avoid products containing alcohol and other chemicals and artificial ingredients. On the other hand, if you have an oily and acne-prone face then some chemicals in your face wash might do you good. Some acne face washes can contain natural and organic ingredients, while others might use artificial chemicals. However, this doesn’t necessarily equal the strength of a product. Many natural face washes are even stronger than conventional ones. The budget is another big factor to consider when it comes to choosing an acne face wash. The range of price for such products can go anywhere from $5 to hundreds of dollars. So, figure out how much you want to spend on your acne face wash and then try to find the best product that doesn’t go over your budget. Some acne face washes are meant for severe acne while others are meant to treat only mild and moderate acne. Always make sure that you do your research before choosing a product. Finally, the last thing you need to keep in mind when it comes to acne face wash is to make sure that the product you choose is oil-free. Acne is usually the result of too much oil or sebum production, so choosing a product that contains oil might be counterproductive. All of these ingredients mentioned above are meant to unclog your pores and clear out blocked sebum, thus clearing your face from all the blackheads. And acne is exactly this – inflamed, irritated and blocked pores. Benzoyl Peroxide is an incredible acne-fighting agent, especially when it comes to acne caused by the bacteria p.acnes. Glycolic Acid and Salicylic Acid will help you with acne scars as well as diminish the appearance of acne marks and hyperpigmentation. Pyrithione Zinc is there if you suffer from pityrosporum yeast-based acne and other skin problems. And finally, Sulfur as an ingredient will remove dead skin cells from the surface of your face and unclog blocked pores. If you don’t know where to start and aren’t sure which ingredient will work best for you, try products with Benzoyl Peroxide first. Such products are usually well-tolerated and work for most people. After that, analyze your results and see if you need to add other products to your acne-fighting routine. Washing and cleaning your face in a proper way is important for everyone, but especially important if you suffer from acne. No matter which other acne-fighting products you use, starting with a clean face is crucial. When your face is clean, all your other products will absorb better and show better results. Plus, the fact that your face wash will also bring active ingredients for fighting acne is yet another huge reason why you need to try these products. Use your acne face wash first thing in the morning, to get rid of all the bacteria and oils that accumulated throughout the night, and each night before going to bed, to remove all the products and dirt that gathers throughout the day. Washing your face twice a day is the ideal number. Cleaning your face only once is not enough while cleaning it more than twice can be counterproductive and irritating for your skin. All facial cleaners usually require that you make your face wet first. To do this, use lukewarm water – not too cold and not too hot. This will prevent skin burns and irritations and keep your skin balance in check. When it comes to acne face washes, a little goes a long way. Usually, it’s enough if you just use a coin-shaped amount of cleanser. Depends on how sensitive your skin is, you can either use your fingers or an exfoliating sponge or brush. However, if you do have active acne on your face or open sores, we recommend staying away from exfoliation for some time. In such cases, it’s best to use your fingers when washing your face. No matter if you choose to use your fingers or another tool, you always need to do this with clean hands and tools. This is in order to avoid any additional bacteria sticking to your skin. The next step is to massage the cleanser into your skin, making sure that every inch of your facial skin has been washed. After that, rinse your face well with lukewarm water and make sure that you remove the product completely. After you’ve washed the product off your face, gently pat dry your face with a clean and soft towel. Don’t be too harsh on your skin. Finally, once your face is completely clean and dry, move on to applying any additional products you use. Good options for people who suffer from acne are facial toners and/or astringent. Toners and astringents will additionally clean oils from your face as well as provide you with more acne-fighting active ingredients. In the end, apply an oil-free and water-based moisturizer – a type that wouldn’t harm your acne-prone skin. My first suggestion for an acne face wash is the La Roche-Posay Effaclar Medicated Gel Cleanser for acne-prone skin. This face wash contains a 2% Salicylic Acid as its main active ingredient. Aside from this, it also contains Lipo Hydroxy Acid (LHA), which smartly targets oily areas and removes all the excess oil and dirt from your pores. The La Roche-Posay Effaclar Medicated Gel Cleanser promises to reduce your face oils by up to 47%, which means your pores will be significantly less oily, thus preventing blockage, blackheads, and acne. Furthermore, the La Roche-Posay Effaclar face wash is dermatologist tested and allergy tested, which means it’s safe to use even for people with sensitive skin. As an additional plus, this product is fragrance-free, oil-free, and paraben-free. The pH of this product is 5.5, and it works best for an oily and sensitive skin. My second choice of acne face wash is a bit different than others in the sense that it does not contain any chemicals and harsh ingredients. The Basis Cleaner Clean Face Wash is a foamy cleanser which contains refreshing mint, lemongrass which is an incredible purifying agent, and soothing aloe botanical. This product is 100% oil-free and soap-free! Next, the Basis Cleaner Clean Face Wash will clean your face thoroughly, without leaving any product residue behind. It is powerful enough to remove any make-up products, as well as all the dirt, bacteria, and oils that have accumulated throughout the day. This product works best on normal to oily skin, although many users have reported that it also works on dry skin since it doesn’t dry it out additionally. The Neutrogena Oil-Free face wash is my third product of choice when it comes to acne face washes. This product is based on a formula which contains Salicylic Acid as the main acne-fighting agent. The absorption of the Salicylic Acid in this face wash is greatly boosted thanks to its micro-clear technology. Aside from Salicylic Acid, the Neutrogena Oil-Free Acne Face Wash also contains other skin conditioners which help promote health and softness. This product helps prevent acne breakouts, efficiently unclogs blocked pores, and claims to treat acne even before they emerge. All things considered, it’s an excellent product with a price that’s usually affordable for most people. However, one thing to keep in mind when it comes to using products that contain Salicylic Acid is that they might be a bit too drying on your skin. Make sure that you deeply hydrate your skin after using the Neutrogena face wash with a rich moisturizer. You might want to start by using it only once a day until your skin gets used to the product. After that, you can move on to using it twice a day like any other face wash. Be especially careful if you have dry and sensitive skin as this product might be too harsh for you. My fourth product of choice is the Biore Charcoal Acne Clearing Cleanser for Oily Skin. This product uses Salicylic Acid as the main ingredient, as well as charcoal powder for even better results. The Salicylic Acid is there to remove all the dirt and bacteria from your pores as well as reduce oil production. The charcoal powder is a natural ingredient which absorbs dirt and oil from your face. The combination of these two ingredients together can be an extremely powerful cure for acne. The Biore Charcoal Acne Clearing face wash is dermatologist tested and oil-free, which means it will not clog your pores additionally. What’s more, this product claims to leave you with clearer skin in just two days! For those of you who enjoy a cooling and slightly tingling sensation, this product has a menthol fragrance which leaves your skin feeling tight and fresh after washing. In order to see maximum results, use this product twice a day, once in the morning and the second time in the evening before going to bed. Daily use of this product can greatly diminish the appearance of your blackheads. Be careful if you have dry skin since the Salicylic Acid can dry it even more. And finally, this is a very cheap product when compared to others of its type while still giving incredible results. Last but not least, my fifth recommendation for everyone reading this is the Humane Benzoyl Peroxide Body & Face Wash. As the name itself suggests, this product is meant to be used for your face as well as any problem areas on your body, thus a great option for anyone who suffers from issues such as back acne. The Humane body and face wash is a strong product which contains 10% Benzoyl Peroxide. This acne-fighting agent kills p.acnes bacteria on your skin which prevents acne breakouts. This product is in the form of a lotion which has to stay on the skin for some minutes and then be washed off. This allows the active ingredients in the product to absorb into your skin and do their magic. However, if you have sensitive skin, this product might not be the best option for you. 10% Benzoyl Peroxide can be too much for sensitive skin and can cause dryness and peeling. If you notice any side effects such as redness, irritation, dryness, peeling or breakouts, use the product only once a day and always make sure that you moisturize your face afterward. After reviewing this list of 5 best acne face wash, it’s time to declare the winner product. 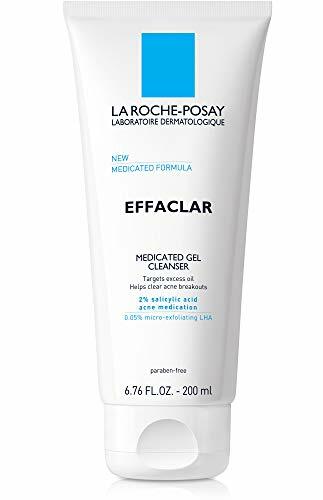 Based on the ingredients, the overall user satisfaction, as well as my own experience with the products listed above, I have to conclude the La Roche-Posay Effaclar Medicated Gel Cleanser as the winner face wash. The La Roche-Posay face wash contains 2% Salicylic Acid as the main active ingredient, plus Lipo Hydroxy Acid (LHA) which allows you to target your oily areas and successfully remove all dirt and extra oil. Furthermore, this product is fragrance-free, oil-free, and paraben-free. And finally, it is allergy tested and gentle enough to be used even in people with sensitive skin. If what you’re looking for is something more harsh and powerful, you might want to choose the Humane Benzoyl Peroxide 10% Acne Treatment Body & Face Wash, 8 Ounce. This product is strong and has proven to help people who couldn’t find a solution elsewhere. However, do not use this product if you have sensitive skin because it can cause redness, irritation, and peeling. Hopefully, I’ve managed to help you make the right decision in purchasing an acne face wash that works for you. Remember, when choosing a product you have to take many things into consideration. First, your skin type. Then, the preferred active ingredient. And finally, the strength of the product depending on the severity of your acne. One last thing to consider is that acne treatment products might take a while until you see visible results, so always be persistent in your product application routine. This list of 5 best acne face wash is created to give you an insight into the different specifications and ingredients of each product. All of these products enjoy great reviews and customer satisfaction, so the only thing left for you to do is choose the product that best fits your needs and shares your experience! Omg, thank you for writing this review.